Mukesh Dhirubhai Ambani was born on 19th April 1957, to Dhirubhai Ambani and Kokilaben. 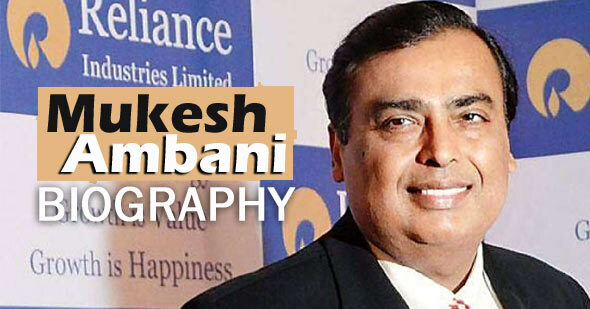 He is Chairman and MD of Reliance Industry Limited, India’s second most valuable company. RIL deals mainly in refining, petrochemicals, and in the oil and gas sectors. Reliance Retail Ltd., another subsidiary, is the largest retailer in India. Mukesh Ambani was also on the board of directors of Bank of America Corporation and the international advisory board of the Council on Foreign Relations. He also served as the Chairman of the Board of Indian Institute of Management Bangalore. Mukesh Ambani completed his schooling from the Hill Grange High School in Mumbai. Later he received BE degree in Chemical Engineering from the University of Mumbai. Mukesh Ambani, for his higher studies, enrolled for an MBA from Stanford University but from where he dropped out to help his father build Reliance, which at that time was still a small but rapidly growing enterprise. Mukesh Ambani joined Reliance in 1981, and it was his brain which made it possible to turn textile into polyester and further into petrochemicals, petroleum refining rising up to oil and gas exploration and production. While working in Reliance, Mukesh Ambani set up Reliance Infocomm Limited, which was focused on information and communications technology initiatives. At present, he is working as chairman and MD of RIL and holds 44.7% shares of the company. He is among the richest person in the world in Forbes listing. He created world’s largest grassroots petroleum refinery at Jamnagar, India. Mukesh Ambani is ranked 5th best performing CEO in the world by Harvard Business Review in its ranking of top 50 global CEOs. In 2010, he was given a Hon. DSc (Doctor of Science) degree by M.S. University, Baroda. During his career he won many awards by different organizations like, Ernst and Young Entrepreneur Of The Year, 2000 (by Ernst and Young India), Global Vision Award, 2010 (by Asia Society), Business Leader of the Year, 2010 (by NDTV India and Financial Chronicle), Global Leadership Award, 2010 ( by Business Council for International Understanding).